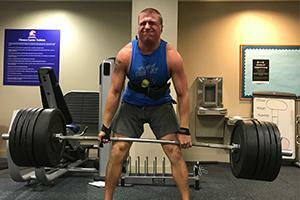 Isaac Calvert, SIS '20, participates in the dead-lift challenge during Healthy Campus Week. Isaac Calvert is trying to lift a quarter ton. That’s the equivalent of a year-old elephant. It’s what Calvert’s doing to clear his head between classes. Those 500 pounds (if he can hoist them) will be his entry to a contest at the Cassell Fitness Center, which is celebrating its fifth anniversary during Healthy Campus Week — and if he’s the biggest lifter of the day, he’ll win some swag. But that’s not why he’s there. The SIS junior is a regular at the north campus fitness center. After all, he lives across the street at Leonard Hall, and having a gym in a nearby residence hall is part of what he loves about campus life. In his long-term future: Military service, since he’s a Second Lieutenant in the US Army. (AU has students from all five branches of the military.) Then, he hopes, a career with a government agency where he can put his AU knowledge to work. In the immediate future, sitting on the floor in front of him: Those 500 pounds. “I won’t lie, I’ve never lifted this much before,” he says. It’ll be his second lift of the day. His first logged 495 pounds, but he just couldn’t take being so close — just shy of a quarter ton — without pushing for the extra five pounds. So they went on the barbell, and here goes. Focus, he tells himself out loud. Focus. Focus. Focus. Focus. Places like the Cassell Fitness Center, where students like Calvert can get healthy and stay healthy, are important parts of life at AU. Healthy Campus Week is highlighting a broad range of those services this week in events planned collaboratively by several units: AU RecFit, the Counseling Center, and the Health Promotion and Advocacy Center. The deadlift contest was also an event involving cross-unit collaboration, planned by staff at RecFit and Housing and Residence Hall. At the end of the day, Calvert’s 500-pound, year-old elephant-sized lift won him the men’s championship. The women’s champion was Liz Pham, a student in the CAS graduate program in Health Promotion Management, who lifted 230 pounds — which, for the record, is the weight of a mama grizzly bear. And of course, the 14 students who recorded their lifts for the contest weren’t the only ones working up a sweat between classes. Stop by campus fitness facilities any day, and you’ll find a lot of energetic students. Balancing academics and fitness is a big challenge, but it’s one that many students are intent to achieve, and AU is working to help make it happen.